Secondary cancers. Scintigram of a patient with secondary cancers affecting the lungs (lower centre), bone (far left) and brain (top). These cancers have spread (metastasised) from the thyroid gland (primary cancer). Treatment of secondary cancers depends on what the primary cancer is, but may involve a combination of chemotherapy and radiotherapy to reduce and control the secondary tumours. 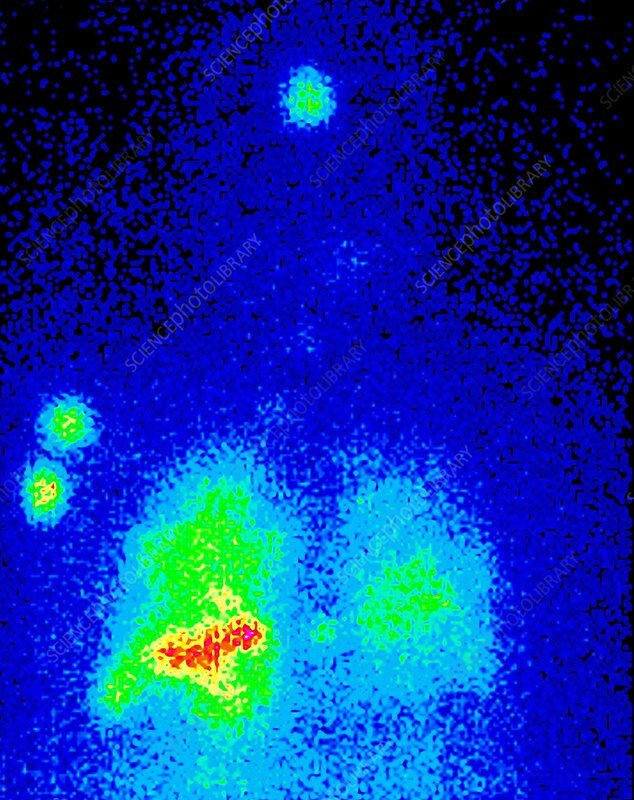 Using the radioactive tracer iodine-131, a scintigram shows the spread of cancer from a thyroid gland because the metastasised thryoid tissue takes up the iodine and becomes visible on the scan.